Go to Starfall.com and play All About Me. Do all four activities (Who Am I?, What is My Pet, Where Do I Sleep, Which is My Toy). Then play the four "About My" games on the right hand side. 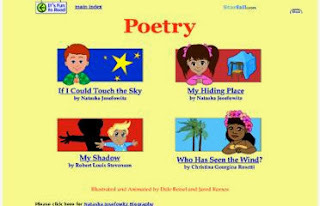 Next visit Starfall Poetry. Click the ear icon to read each page from all four poems. Can you find the hidden buttons on each page? Then, choose an activity from level 2 at Starfall (It's Fun to Read).